0 A psalm of David. A petition. 2 For your arrows have pierced me, and your hand has come down upon me. 3 Because of your wrath there is no health in my body; my bones have no soundness because of my sin. (Mark 10:46-5) 46 Then they came to Jericho. As Jesus and his disciples, together with a large crowd, were leaving the city, a blind man, Bartimaeus (that is, the Son of Timaeus), was sitting by the roadside begging. 12 Those who seek my life set their traps, those who would harm me talk of my ruin; all day long they plot deception. 14 I have become like a man who does not hear, whose mouth can offer no reply. (Luke 8:42b-48) As Jesus was on his way, the crowds almost crushed him. 19 Many are those who are my vigorous enemies; those who hate me without reason are numerous. 20 Those who repay my good with evil slander me when I pursue what is good. (Matthew 15:21-28)21 Leaving that place, Jesus withdrew to the region of Tyre and Sidon. (John 5:1-9)1 Some time later, Jesus went up to Jerusalem for a feast of the Jews. The psalmist continually cries out to the Lord despite the realization of his own sinfulness, weakness, and ugliness. Throughout the gospels, Jesus introduces us to heroes of the faith, who like the psalmist, put their faith into action. He encourages the kind of faith they demonstrated. Let’s also cry out to God and experience his miraculous power in our lives. 1. 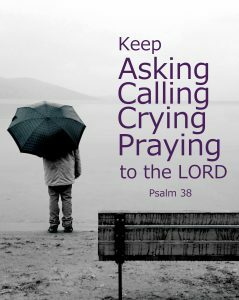 Why was the psalmist able to cry out to God in times of hardship? 2. Let’s share our experiences of crying out to God and receiving an answer.